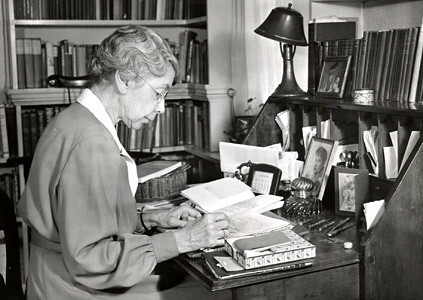 Winifred Smith was born in Cincinnati, Ohio, in 1879 to Biblical scholar Henry Preserved Smith and his wife Anna Macneale. When she was thirteen, her father was tried and convicted of heresy by his presbytery for questioning the literal truth of the Bible. According to professor emeritus of drama Evert Sprinchorn, her father's conviction "was a traumatic experience… It made her a lifelong radical in the realm of thought and led her to becoming a Victorian sentimentalist who never married." All her life, Ms. Smith identified herself as a "daughter of a heretic" and an atheist. She entered Vassar in 1901, calling herself "a somewhat irregular sophomore, living off campus with Professor Bracq's family, where we spoke French most of the time." A fellow faculty member recalled, "Of her work as a student at the college, [Ms. Smith] has written that 'Miss [Florence] Keyes's extraordinary course in Shakespeare was the beginning of my life long interest in drama.'" Ms. Smith also spoke of her debt to Miss Laura Wylie, calling her "the most remarkable of my teachers… She encouraged me to go on to graduate work in English and Comparative Literature at Columbia, and after I had earned my PhD called me back as an instructor." Having earned her A.M and Ph.D. at Columbia, Ms. Smith returned to the Vassar English Department in 1911. She taught the freshman required reading course in English "writing and reading" and the survey course in literature. At her retirement, she wrote a short autobiography, recalling fondly her years as an instructor: "I was allowed complete freedom in choosing and organizing my material, though there was much consultation with the other teachers of these elementary courses. We were all supposed to have conferences with each student in these classes at least twice a semester, and most of us devoted about half our time to these interviews. "President Taylor, a genial man but a very conservative one, had written me when I was appointed, advising me of 'a teacher's responsibility not to disturb the faith of the young.' He worried about my influence on my students, knowing that I was the daughter of a heretic, and to him almost as damning a fact, that I was an ardent worker for woman-suffrage, like all of my colleagues in the English Department. This activity and a lively interest in the Poughkeepsie community was encouraged by Miss Wylie and by all the outstanding members of the faculty, many of whom, like me, organized meetings, spoke at them, and learned a great deal from such activities." Ms. Smith's community continued after suffrage was achieved in 1920. She focused her efforts on the Poughkeepsie Women's City Club (later the City and County Club), serving as director for a decade. She also served on the board of the Poughkeepsie Community Theater, a project started by fellow professor Gertrude Buck. When the theater disbanded in 1932, Ms. Smith's search for alternate community work led her to Sarah Lawrence College, a fledgling women's college in Yonkers, NY, where she served as a Trustee for the next twelve years under Chair of the Board and Vassar President Henry Noble MacCracken. Her interest in education also led her to work on the Advisory Committee of the Poughkeepsie Day School, a progressive experiment in coeducation. 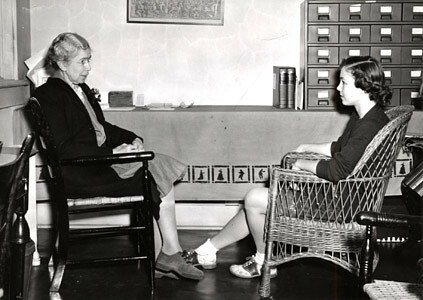 Ms. Smith "never for a moment… thought of education apart from the rest of her life," noted Molly Day Thatcher '28. Winfred Smith's specific academic focus was the Italian commedia dell'arte, a primarily improvisational dramatic form that flourished during the 16th century. She wrote two books on the subject, one of which is still considered a usable text. Commedia dell'arte means literally "comedy of professional artists," and it is a unique kind of drama in that there are very few documents of any of the performed pieces. All that exists are outlines for basic situations that were used by various troupes during the era. "Here was a woman," remarked Evert Sprinchorn, "Who knew that dramatic literature could not be fully understood and appreciated unless it was seen in its physical aspect and not simply as disembodied words. Drama could not be separated from theater." Perhaps because of her unique area of study, Ms. Smith's approach to drama was always based upon its contemporary society. This approach also inspired her to support and aid student production on campus. She believed a sound dramatic education depended upon practical application in the theater. Only by performing and producing a work of dramatic literature could students fully understand its reflections upon society. As her student Molly Day Thatcher '28 observed, "She sees the theatre as part of its times… She saw the various theatres as products of their cultures, influencing them in turn." Her belief in the interdependence of drama and society led Ms. Smith to believe that all aspects of life were equally interwoven. Thatcher says, "She never admitted a line between the college and the 'outside' world. Always, axiomatically, matter-of-factly, she accepted that we live in one world." This view of the world compelled Ms. Smith to fight against the autonomy of departments, foreshadowing the interdepartmental focus of Vassar's current curriculum. Pushing for more academic cooperation among Vassar faculty, she organized two joint courses with other concentrations. Along with members of the French and History departments, she created a cooperative group of the survey courses within each department. The teachers of each course met often to consult and plan nine weekly meetings of the separate classes. "This arrangement, started as an experiment, proved so successful that it has left its trace in the present requirements of the English department for their freshman course in Periods of Literature," said Ms. Smith in 1947. Her second foray with interdepartmental collaboration resulted in the English course "Tragedy: Greek, Renaissance, and Modern," which included two teachers from the Greek Department as well as Ms. Smith. The course, according to Ms. Smith, taught students "not only about literature but about human nature." Remnants of this approach are still visible in Drama 221: Sources of World Drama, as well as the interdepartmental majors. "During all these experiments in cooperation with my colleagues," said Ms. Smith, "I became acutely aware of the need for drama students to have some experience in acting, writing, and producing plays, not merely under student direction but with teachers who understood the various branches of theatre art." In 1916, Ms. Smith founded a theatrical museum at the college as a resource for dramatically minded students. She also applied her remarkable linguistic abilities to translating Italian futurist plays for Vassar students to perform. Ms. Smith avidly supported the Dramatic Workshops that began in 1916 under Gertrude Buck's leadership, and she promoted student theater with constructive reviews and courses on dramatic literature that often led to student performances. Still, Ms. Buck recognized that student theater alone couldn't satisfy the need for a true theatrical education at Vassar. Ms. Smith and her colleague, Hallie Flanagan, began to agitate for an autonomous Drama Department that would give students the opportunity to perform dramatic literature on a stage as it was meant to be experienced. In 1930, the college founded its Experimental Theater, which provided resources to student productions, and in 1939, the Vassar Drama Department was established, with Ms. Smith as its chair. She continued as head of the Department until her retirement in 1947. At her retirement, Miss Smith said of her Vassar experience, "It has all been great fun." Though retired, Ms. Smith continued to teach courses on drama to community women through the American Association of Women. She also chaired the arts committee of that organization, and in 1958, the AAW established a "Winifred Smith Grant" – a $500 scholarship for a local student. She stayed closely connected to the Vassar community, and upon her death in 1967, Vassar faculty member Susan J. Turner said, "Miss Smith has been recognized as one of Vassar's great teachers; she was also one of its greatest rebels." Winifred Smith Collection. Box 3. Folders 19a – 27. Vassar College Special Collections (VCSC). "Perspectives on Broadway" by Molly Thatcher '28 from Vassar Quarterly, Feb. 1947. Vassar College Library (VCL). "Memorial Minute for Winifred Smith" read April 10, 1968 by Susan J. Turner. Winifred Smith Collection. Box 3. VCSC. "Stagestruck in Academe" by Evert Sprinchorn" from Vassar Quarterly Spring 1991. VCL. Winifred Smith's role in establishing the Shakespeare Garden is recognized among Vassar's many remarkable innovations.